In stock -This product will ship today if ordered within the next 13 hours and 1 minutes. 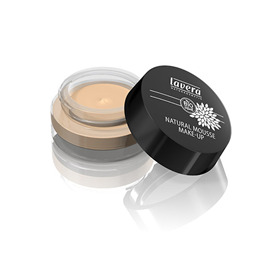 lavera Natural Mousse is velvety soft and is made with pure natural and organic ingredients. It simply blends onto the skin giving a flawless matte look. It is a light textured formula, giving a light to medium coverage without feeling heavy. Dodecane, Silica, Helianthus Annuus (Sunflower) Seed Oil*, Ricinus Communis (Castor) Seed Oil*, Tricaprylin, Lauroyl Lysine, Canola Oil, Hydrogenated Vegetable Oil, Hydrogenated Rapeseed Oil, Olea Europaea (Olive) Fruit Oil*, Butyrospermum Parkii (Shea Butter)*, Argania Spinosa Kernel Oil*, Theobroma Cacao (Cocoa) Seed Butter*, Cocos Nucifera (Coconut) Oil*, Hippophae Rhamnoides Fruit Extract*, Rosa Centifolia Flower Extract*, Malva Sylvestris (Mallow) Flower Extract*, Tilia Cordata Flower Extract*, Lecithin, Hydrogenated Lecithin, Vegetable Oil (Olus Oil), Camelina Sativa Seed Oil, Tocopherol, Aqua (Water), Alcohol*, Helianthus Annuus (Sunflower) Seed Oil, Ascorbyl Palmitate, Fragrance (Parfum)**, Limonene**, Benzyl Salicylate**, Linalool**, Geraniol**, Citral**, Citronellol**, Benzyl Alcohol**, Benzyl Benzoate**, [+/- Mica (CI 77019), Titanium Dioxide (CI 77891), Iron Oxide (CI 77492), Iron Oxide (CI 77491), Iron Oxide (CI 77499), Bismuth Oxychloride (CI 77163), Tin Oxide (CI 77861)]. Using a cosmetic sponge, apply the organic mousse foundation to the sponge and apply to your skin using circular motions starting at your forehead working your way down to the jaw and neck area ensuring the mousse blends into your skin. Below are reviews of lavera Natural Mousse Make Up Ivory 01 - 15g by bodykind customers. If you have tried this product we'd love to hear what you think so please leave a review.